Advantage II is a monthly flea preventative for dogs and cats that offers comprehensive flea protection by killing adult fleas, larvae, and eggs. 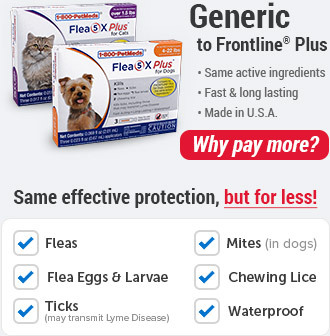 Plus, it kills fleas through contact, which means fleas don't have to bite your pet to die. Advantage II also treats, prevents, and controls lice on dogs. Advantage II does not kill ticks, so we recommend using the Preventic Tick Collar along with Advantage II (dogs only). Advantage II for small cats 5-9 lbs can also be used for ferrets weighing 1 lb or over and 10 weeks of age or older. What is the most important thing I should know about Advantage II? The active ingredients in Advantage II are Imidacloprid (9.1%) and Pyriproxyfen (0.46%). Advantage II Kitten, Advantage II Small Cat and Advantage II Large Cat are once a month topical flea prevention and treatment for cats and kittens over 8 weeks or older. Advantage II Small Cat may also be used for ferrets weighing 1 lb or over and 10 weeks of age or older. 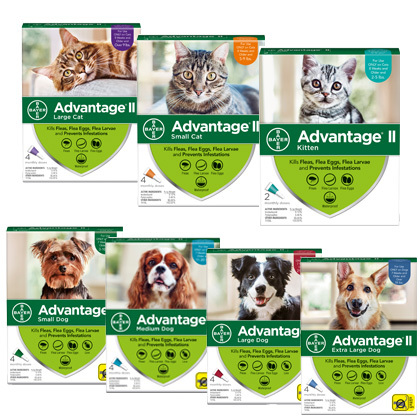 Advantage II Small Dog, Advantage II Medium Dog, Advantage II Large Dog, and Advantage II Extra Large Dog are once a month topical flea prevention and treatment for dogs and puppies 4 lbs or more and 7 weeks or older. Advantage II kills all flea life stages. 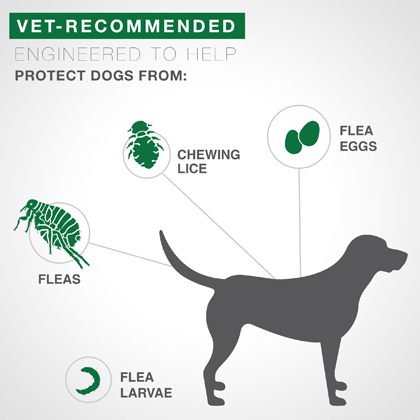 Advantage II kills fleas within 12 hours of application. Advantage II for Dogs also treats, prevents, and controls lice infestations. Advantage II is waterproof and fragrance free. 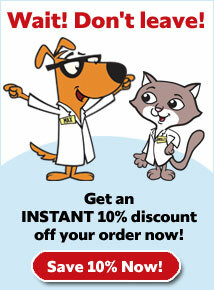 Advantage II for cats or ferrets and Advantage II for dogs are non-prescription (OTC) products. What should I discuss with my veterinarian before giving Advantage II to my pet? Consult a veterinarian before using on medicated pets, if the pet is being given this product along with other pesticides, and debilitated, aged, pregnant or nursing pets. How should Advantage II be applied? Advantage II Kitten is available in 0.23 ml applicators for kittens 2-5 lbs (turquoise). Advantage II Small Cat is available in 0.4 ml applicators for cats 5-9 lbs or ferrets weighing 1 lb or over and 10 weeks of age or older (orange). Advantage II Large Cat is available in 0.8 ml applicators for cats 9 lbs & up (purple). Advantage II Small Dog is available in 0.4 ml applicators for dogs 3-10 lbs (green). Advantage II Medium Dog is available in 1.0 ml applicators for dogs 11-20 lbs (teal). Advantage II Large Dog is available in 2.5 ml applicators for dogs 21-55 lbs (red). 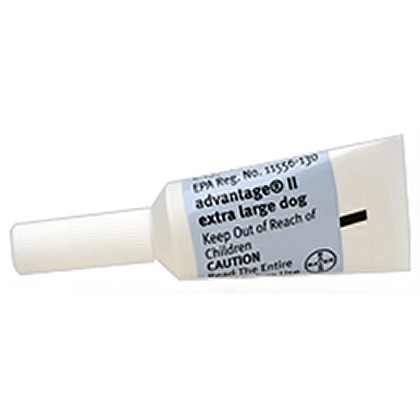 Advantage II Extra Large Dog is available in 4.0 ml applicators for dogs over 55 lbs (blue). To apply, place the applicator tip through your pet's hair to the skin level. On cats and ferrets, apply to skin on neck at the base of the skull. 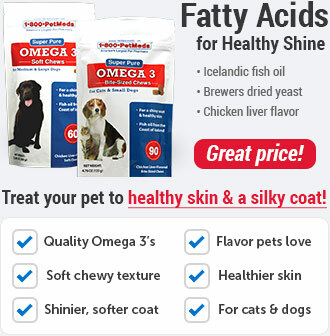 For dogs up to 20 lbs, apply to skin on back between the shoulder blades. For dogs 21 lbs or over apply the contents of one tube to 3 or 4 spots along the skin on back from the shoulder to the tail. 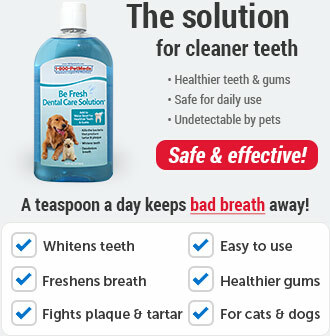 Do not get this product in the pet's eyes or mouth. What are the potential side effects of Advantage II? What happens if I miss giving a dose of Advantage II? If a dose is missed, apply the usual dose of Advantage II and resume a monthly dosing schedule. What happens if I overdose my pet on Advantage II? What should I avoid while giving Advantage II to my pet? 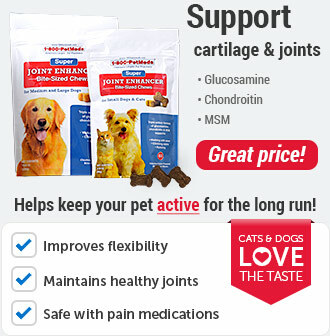 Advantage II is for external use on dogs and puppies 3 lbs or more and 7 weeks or older, cats and kittens 2 lbs or more and 8 weeks or older, or ferrets weighing 1 lb or over and 10 weeks of age or older. This product causes eye irritation in humans and is harmful if swallowed. Avoid contact with skin. Call poison control center if swallowed. If on skin, wash with plenty of soap and water. If in eyes, flush with plenty of water. What other drugs will affect Advantage II? Consult your veterinarian prior to giving this product along with other pesticides. 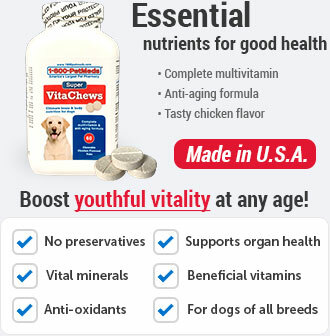 Only use Advantage II on dogs/puppies over 3 lbs and over 7 weeks of age, cats/kittens over 2 lbs and over 8 weeks of age, and ferrets 1 lb or over and 10 weeks of age or older. Apply Advantage II once a month every month. For dogs up to 20 lbs, part the pet's hair between the shoulder blades until you can see the skin. Place the tip of the applicator on the skin and release all of the tube's contents on a single spot directly on the skin. For dogs 21 lbs and over, apply entire contents of the tube evenly in 3 or 4 spots on the top of the back from the shoulder to the base of the tail. At each spot, part the hair until the skin is visible. Place the tip of the applicator on the skin and release a portion of the Advantage II solution directly on the skin. Do not apply an excessive amount of solution at any one spot that could cause some of the solution to run off the side of the dog. For kittens, cats and ferrets, place the applicator tip through the cat's hair to the skin on the neck at the base of the skull and release all of the tube's contents on a single spot directly on the skin. Under normal conditions Advantage II is effective for a month. 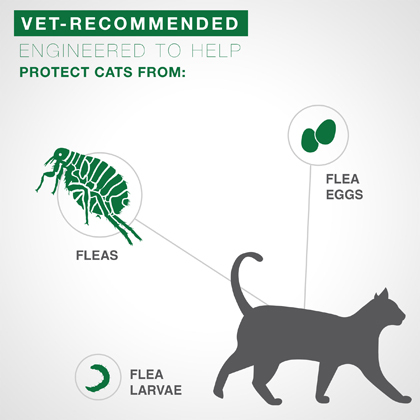 However, in case of severe flea infestation, retreatment may be necessary earlier than four weeks. Do not re-treat cats or dogs more often than once every 7 days. For ferrets, do not retreat more often than every 14 days. After flea control is obtained, return to a monthly treatment. Store this product in a cool dry place. Do not store in the refrigerator. Do not reuse empty container. Do not contaminate water, food or feed by storage or disposal. To dispose of empty container place in trash or offer for recycling if available. If container is partly filled call local solid waste agency for disposal instructions. Never place unused product down any indoor or outdoor drain. Keep out of reach of children and pets.